X will be home to a curated community of fast growing tech startups in the heart of Amsterdam. A label for growth where startups, corporates, investors and mentors come together to multiply their output and ideas. Visit x.works to sign up for further announcements! It’s funny how things work out. Back in 2006, TNW co-founder Patrick and I were working on a now long-defunct startup with next to no budget. We couldn’t afford to exhibit at or even attend an event to get our name out there, so we held our own in Amsterdam – problem solved. Yet during the first edition, we quickly realised what we had built had more potential than our actual startup; so when we welcomed TechCrunch founder Michael Arrington to the stage, we found the inspiration for our expansion plans. While Michael spoke about adding an event to his successful blog, Patrick and I set about working in reverse. Fast-forward to 2015, and TNW Conference has experienced its 10th anniversary, our blog has become an internationally renowned technology news outlet with writers and events all over the planet, and we’ve expanded in multiple other directions. But Amsterdam is still our home, and we thought that the time was right to show our commitment to that fact. As of today, we’re announcing that The Next Web is set to become the proud host of a new technology hub in the heart of Amsterdam – called X. So why are we diversifying into physical space? The Amsterdam tech scene is thriving – year on year, we see impressive improvements in our rankings as a global hub. But we felt we could help provide the answer to putting Amsterdam on top: community. We live and breathe this city, our headquarters are here, and so is our industry-leading conference. But we wanted more. We wanted a way to bring the enthusiasm and atmosphere of our events to Amsterdam all-year round, in turn stimulating the same much-needed enthusiasm from VCs and new talent. As Google’s Director of Partnerships, James van Thiel, pointed out when we discussed the concept with them, X will help bring the buzz of a growing ecosystem to a physical center: something that is vital for startups. The space will host carefully selected technology startup residents, innovative corporate partners, as well as open, publicly available spaces for working, meeting and socialising. That conversation we had with Google also ended positively: X is set to become the official home of the Google for Entrepreneurs Network in the Netherlands. As a result, Google will be offering their local mentoring program, as well as initiatives like demo days with international guests, global exchange programs and training sessions designed to help Dutch startups grow. The new concept will be housed in a 6,000m² (65,000ft²) building in the center of Amsterdam, and will include open collaboration spaces, private offices, innovation labs, dining, a 1,000m² (11,000ft²) basement for hosting spectacular events and a top floor offering amazing views across the city, which will be open to the public. All extremely exciting. But why X? We had the opportunity to name our new project anything. Why choose something so commonly used as a placeholder until further notice? The beauty of ‘X’ lies in its very ability to function in this manner. ‘X’ is neutral. In the meeting of two values, it plays the host, allowing them to multiply into something new – and something greater. This isn’t just the case in a mathematical equation where 2 x 2 = 4. The ‘x’ has also long been the mark of collaboration; the symbol bonding two entities together. 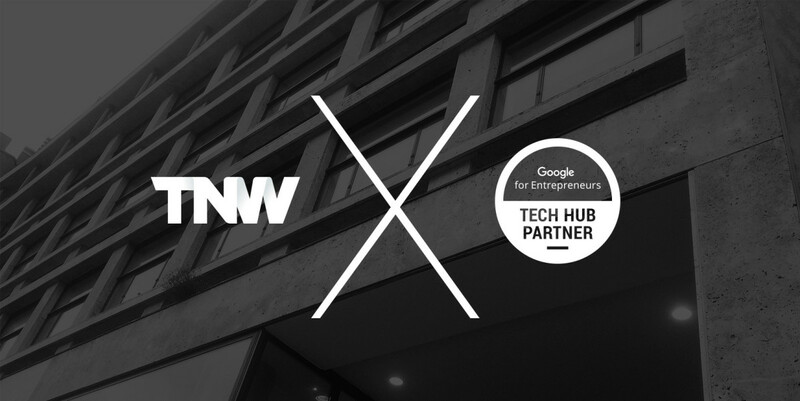 X is a TNW x Google collaboration, and our goal is for it to host many more partnerships and opportunities throughout the Dutch tech scene over the coming years. We’ll do this by representing the crossroad or intersection between corporate and startup, and the Dutch technology scene in general. ABN AMRO, Booking.com and KPMG are also on board as partners, and their goal is to participate in exactly these sorts of collaborations with the startups that we’ll be inviting to make X their home. Our aim is to house 100 to 120 of these curated startups, as well as 500 workspaces, and 1,000 like-minded, daily visitors – from entrepreneurs and investors to mentors and consultants. We hope this will make for the sort of space that breeds incredible innovation, opportunity, and as I said earlier on: community. More than anything else, I cannot wait for the ease of passing each of you on a Friday afternoon, and inviting you to join me for a drink. I can’t wait to bring the Amsterdam tech scene together in one place. Let’s not forget that the ‘X’ is intrinsic to our city: three of them make up our coat of arms and flag. We look forward to welcoming you to your new home for working, networking and exceptional growth. Stay tuned for more news! ➤ Visit x.works to sign up for further announcements!